Once more, with feeling: As Google Drive slashes prices, how low can storage prices go? It’s déjà vu all over again: Google is cutting the prices on Google Drive cloud storage. The price for 100GB is now $1.99 per month, down from $4.99; 1TB is now just $9.99 per month, compared to $49.99 before. This is consumer-oriented storage, for users’ documents and photos, but the downward pricing pressure mimics what’s been happening on the developer-focused cloud storage front as well. For example, there was a flurry of back-and-forth cloud storage price cuts between Google(s goog) and Amazon(s amzn) right around the inaugural AWS Re:Invent event. Those cuts made it clear that storage is sort of like the crack cocaine of cloud computing: Vendors bank that if you put your stuff in their cloud, you’ll keep coming back for more storage and potentially add more higher-priced services. For Google Drive, a relevant comparison is Microsoft OneDrive (formerly known as SkyDrive). Microsoft just offered an array of freebies for that product that gave users 7GB for free and, should they add another 50 GB, they pay just over $2.00 per month ($25 per year). Microsoft also just announced a standalone business plan for OneDrive. And of course, there’s Dropbox, the well-funded company that built its entire business on easy-to-use cloud-based file storage, share and sync. 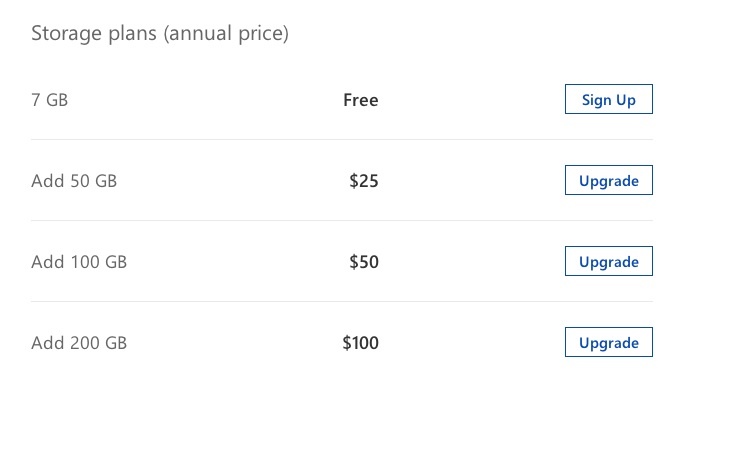 Dropbox gives users 2GB for free. The Pro version for up to 100GB is $9.99 per month. Lets see what dropbox are going to do now!! That’s pretty easy. In a quantity of 1 1TB of space is $33/year based on the prices 4TB hard drives can be had from B&H if one is to apply discounts. At a scale, drive costs are the only costs that matter. Should one not buy into the garbage peddled by the sales people of the likes of big storage vendors that’s the price. Google does not buy into that garbage. anyone else think it would be very interesting to see a graph (ideally interactive) plotting how the costs of storing data and the costs of transmitting data have moved relative to one another over the last 2-3 years? X-axis = time Y-axis is $ per unit stored and $ per unit transmitted for different service types (ie point to point ckt, various flavors of MetroE, Internet, etc, etc) ? gigaom, can you make it happen? Your wish is our command. we’re on it. Give us a little time. I would even throw onto that graph (or create a separate one) including 1GbE, 10GbE, 40GbE, 100GbE and FC HBAs, CPU etc. My point being that we keep hearing about how decoupling compute, storage, network etc combines with the power of the “cloud” to give Enterprises efficiency, flexibility and cost savings. I can tell you that our Enterprise budget is under more stress than ever even though all these service components allegedly are dropping in price. Surely the real question is when will dropbox get in on the act. Their service is far superior just too expensive. I’d happily pay a premium over Google Drive but $100 against Â£24 is too much! Just curious, why do you find Dropbox to be far superior to Google Drive? Google Drive is perfect for me… syncs across all devices, has incredible integrated web based authoring tools (docs), and has very good mobile apps as well. What does Dropbox do better? And thats what I was wondering. Why do I need dropbox if I have google drive. Huge difference: with Dropbox you can share folder only with specific person. Not “anyone with link”. And you can track changes. Works amazingly well for business collaboration. @John H. – You have the option to share a folder only with specific people on Google Drive, too. I use both Google Drive and Dropbox (they are both great products), but Google Drive has been my preferred system for much of the past couple years now. The key advantages for me are the apps (sheets, docs, presentations, forms, etc) which can’t be stored in Dropbox, tight integration with Gmail, easier sharing with Google contacts, and price. Version history is terrific in Google apps and the new “Details and activity” pane is pretty useful, too. Overall, my team has been very successful using Google Drive. @stumblebug Thanx for correction and sharing your experience. I use Dropbox only, guess they got me because of “first to market” advantage lol. But will definitely look at Google drive:) Thanx! A bit late back with my comment and everyone else has answered the biggies already. Sharing folders and document history are major things for me. Document revisions have saved my life (or my thesis) at least twice either form my stupidity of saving over it and also a corrupt DWG file! I guess i just have trust in dropbox to have my back and don’t have that faith in google! !